Motivated by the need of a robust and practical Inverse Kinematics (IK) algorithm for the WAM robot arm, we reviewed the most used closed-loop methods for redundant robots, analysing their main points of concern: convergence, numerical error, singularity handling, joint limit avoidance, and the capability of reaching secondary goals. As a result of the experimental comparison, we propose two enhancements. The first is to filter the singular values of the Jacobian matrix before calculating its pseudoinverse in order to obtain a more numerically robust result. The second is to combine a continuous task priority strategy with selective damping to generate smoother trajectories. Experimentation on the WAM robot arm shows that these two enhancements yield an IK algorithm that improves on the reviewed state-of-the-art ones, in terms of the good compromise it achieves between time step length, Jacobian conditioning, multiple task performance, and computational time, thus constituting a very solid option in practice. This proposal is general and applicable to other redundant robots. 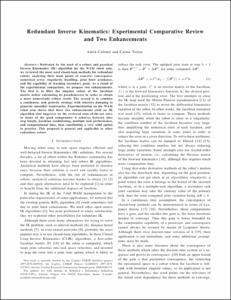 Colomé, A.; Torras, C. Redundant inverse kinematics: experimental comparative review and two enhancements. A: IEEE/RSJ International Conference on Intelligent Robots and Systems. "Proceedings of the 2012 IEEE/RSJ International Conference on Intelligent Robots and Systems". Vilamoura: 2012, p. 5333-5340.